It’s no secret that technology is making building operations more efficient than ever. But checking boxes, filling in blank fields, and circling your selection on paper log sheets is still standard practice when performing building inspections and rounds. And it works great…right? Paper log sheets are tangible and low tech. It’s old school engineering and we love that! But, there are some drawbacks that you can’t afford to ignore any longer. 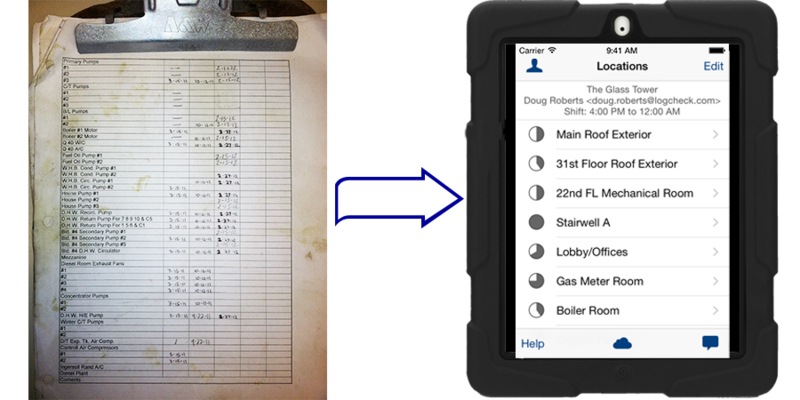 In today’s connected world, paper log sheets are a liability. It may not seem like a big deal, but the hassle of dealing with paper is costing you time and money. Performing rounds should help avoid surprise expenses. But, if you’re paying your staff to manage paper log sheets you are missing out on that savings and the significant added value of digital records. Paper is tangible – Yes you can hold it in your hand and that is satisfying. But it can also be lost, destroyed or tampered with. A paper log sheet needs a human to maintain its template, print or copy it when necessary, deliver it, collect it, and manage a system to store it safely. Paper can only exist in one place, so if you need the data from a log sheet, you will have to make a copy and carry it with you. Easy to lose data – Checking each sheet manually to ensure all the records are there can be tedious. Sloppy handwriting, spilt coffee, or dirty hands can also make what would be good data, useless. You are left with gaps in your data. To recover it will require additional man hours…or you might just hope what is missing won’t come back to haunt you in the future. Lacks historical info – Historical data reveals trends that indicate poor performance, system deterioration, or failure over time. A single log sheet may hold a week or maybe a month’s worth of data, but this may not be enough tell you what’s really happening with your equipment. For example, you know you use more fuel in the winter months, but are you using more than previous years? You would have to dig up those old sheets to find out if your system is performing as expected. Editing procedures on a paper log sheet requires modifying, printing, replacing, and destroying copies of the previous version. Having more than one engineer doing rounds simultaneously puts multiple log sheets on the floor, adding to the burden of managing paper. Without having your eyes on the log sheet, you can’t check in on the status of your rounds. Records have limited value – Without sitting down and transcribing your records into a spreadsheet, the opportunity for real data analysis doesn’t exist. Researching the data from past sheets is a tedious manual operation and creating materials that represent that data is up to you. Eliminate paper completely – Never print another sheet. No more escorting a clipboard around your facility. All your records are taken using your mobile device with our user friendly app. You can also take photos and notes that would never fit in the margin of your paper sheet, and they stay with the record forever. Your data is saved immediately on your device and backed-up indefinitely on our servers. Prevent missing data – LogCheck makes it very clear what checks are complete and which are outstanding with visual indicators on the mobile and web app. Overdue checks are also listed on our customizable email report. We can’t prevent you from spilling coffee on your phone or tablet, but your data will already be safely uploaded to our servers and available on a dry device. Gain remote access to your information – Every record you have ever recorded with all your notes and attached photos can be reviewed from the app or the web dashboard instantly form anywhere. Edit, delete, or reorder your checks from our mobile app or web dashboard. Add a log on your mobile device in the field. Make edits and additions as you find them. No waiting to go back to your desk to edit your template, everyone will have your changes available right away. Data recorded by multiple engineers can be updated instantly to everyone’s device so you won’t do double duty, collect multiple sheets, or transcribe info manually. Jump on the web dashboard or mobile app and you can see what’s happening in your building from a thousand miles away if you want to. Data is updated and available as soon as it is saved. Get much more from your data – Don’t pay someone to slog through your log sheets and punch records into a spreadsheet. LogCheck takes care of that automatically and organizes it just the way you would expect. LogCheck tells you when and who completed each task. Attach a photo to know your engineer was looking at the right equipment. Use the automatically-generated graphs to research a specific time period. Download all your data into one spreadsheet or pick and choose what you’d like to see. Either way the photos, notes, timestamps, and user ID will be included with each record. With all the benefits of going digital, sticking with paper wastes time and exposes you to unnecessary risk. It’s time to upgrade from paper. Whether you’re tech savvy or not, we can get you set up and using digital logbooks in no time. Give LogCheck a try, it’s really simple! Click the button below to request your free trial.